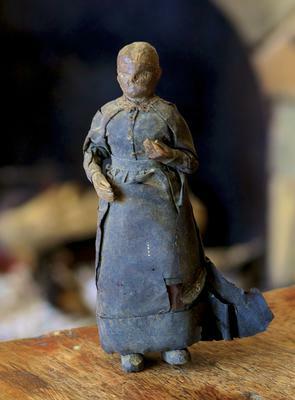 This unusual doll was found in an old trunk in the attic of a burned out building in Framingham mass. about 30 years ago. The trunk contained some old glass photographic plates and other things that were about 1870. The doll could be even older. It is about 7 inches tall, hand carved, the arms lift slightly and the doll is dressed in a very papery thin black fabric. The body and head are of one piece of wood the the two feet are nailed to the bottom of the torso. If you lift the dress on the back side of the doll the letters M.I.W. are to be found, which is interesting as it reads the same way if you hold it upside down. The first time I saw it 30 years ago, it gave me the creeps as it had an ominous feel about it, but not since I recently acquired it, although many whom I have showed it too also get a bit weirded out by it. If anyone can help me identifying this doll, I would be very grateful. Comments for Who made this strange doll and when? ?